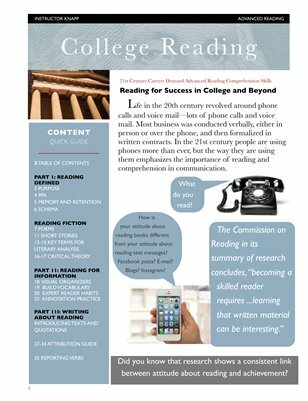 Complete interactive, multi-media course reader includes research-based lessons, key strategies, external reading links and assignments that prepare students for college-level reading and writing. Supports implementation of Common Core Language Arts Standards. Literature provided, but an informational text can be selected by instructor, or chosen through student interest in topic areas. Culminates in student run book club projects and presentations. Teaches the skills required in college for effective reading and writing about reading and appropriate for 11th, 12th grade high school, community college and first year college instruction.